By Designers Fountain-Sedona Collection Oil Rubbed Bronze Finish 3 Light Outdoor | Fountain City Art Ctr. Mesa outdoor lanterns feature a bold, mission style design that complements the exterior decor of any home. The amber glass works with the shape and detailing to provide a rustic look from the fixture and a warm glow from the light. The Mediterranean Patina finish is treated to prevent pitting, tarnishing, corrosion, and discoloration. The sturdy, weather resistant cast aluminum construction and waterproof seal protect the lantern from harsh outdoor elements to ensure the long life of the fixture. 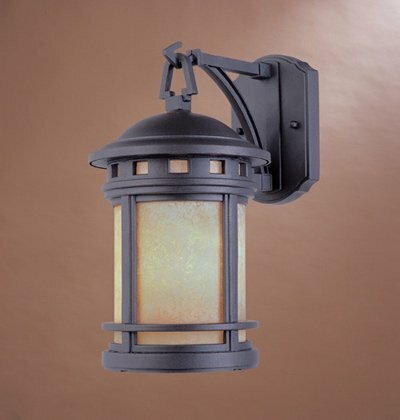 These outdoor lanterns install easily and deliver welcoming, safe and reliable exterior lighting. If you have any questions about this product by Designers Fountain, contact us by completing and submitting the form below. If you are looking for a specif part number, please include it with your message.